A glycogen storage disease (GSD) is the result of an enzyme defect. These enzymes normally catalyze reactions that ultimately convert glycogen compounds to glucose. Enzyme deficiency results in glycogen accumulation in tissues. In many cases, the defect has systemic consequences, but, in some cases, the defect is limited to specific tissues. Most patients experience muscle symptoms, such as weakness and cramps, although certain GSDs manifest as specific syndromes, such as hypoglycemic seizures or cardiomegaly. The image below illustrates the metabolic pathways for carbohydrates. Although at least 14 unique GSDs are discussed in the literature, the 4 that cause clinically significant muscle weakness are Pompe disease (GSD type II, acid maltase deficiency), Cori disease (GSD type III, debranching enzyme deficiency), McArdle disease (GSD type V, myophosphorylase deficiency), and Tarui disease (GSD type VII, phosphofructokinase deficiency). One form, Von Gierke disease (GSD type Ia, glucose-6-phosphatase deficiency), causes clinically significant end-organ disease with significant morbidity. The remaining GSDs are not benign but are less clinically significant; therefore, the physician should consider the aforementioned GSDs when initially entertaining the diagnosis of a GSD. Interestingly, there also is a GSD type 0, which is due to defective glycogen synthase. These inherited enzyme defects usually present in childhood, although some, such as McArdle disease and Pompe disease, have separate adult-onset forms. In general, GSDs are inherited as autosomal recessive conditions. Several different mutations have been reported for each disorder. Unfortunately, no specific treatment or cure exists, although diet therapy may be highly effective at reducing clinical manifestations. In some cases, liver transplantation may abolish biochemical abnormalities. Active research continues. Diagnosis depends on muscle biopsy, electromyelography, ischemic forearm test, creatine kinase levels, patient history, and physical examination. Biochemical assay for enzyme activity is the method of definitive diagnosis. Acid maltase catalyzes the hydrogenation reaction of maltose to glucose. Acid maltase deficiency is a unique glycogenosis since glycogen accumulation is lysosomal rather than in the cytoplasm. It also has a unique clinical presentation depending on age at onset, ranging from fatal hypotonia and cardiomegaly in the neonate to muscular dystrophy in adults. Glucose-6-phosphatase (G-6-P) is the specific enzyme deficiency in Von Gierke disease. GSD type 1b is a similar condition with a defective G-6-P transporter protein. [2, 3] A newly described form, GSD type 1c, is not thought to be related to a transporter protein mutation. 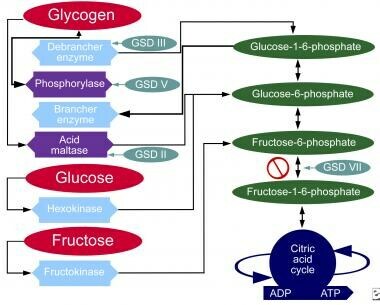 With an enzyme defect, carbohydrate metabolic pathways are blocked, and excess glycogen accumulates in affected tissues. Each GSD represents a specific enzyme defect, and each enzyme is in specific, or most, body tissues. The G-6-P transporter protein is found in the liver and kidney. GSD type Ib is an autosomal recessive condition. Immediate morbidity arises from hypoglycemic seizures. Serious long-term complications include nephropathy and hepatic adenoma. Pan CJ, Chen SY, Lee S, et al. Structure-function study of the glucose-6-phosphate transporter, an eukaryotic antiporter deficient in glycogen storage disease type Ib. Mol Genet Metab. 2009 Jan. 96(1):32-7. [Medline]. Hayee B, Antonopoulos A, Murphy EJ, Rahman FZ, Sewell G, Smith BN, et al. G6PC3 mutations are associated with a major defect of glycosylation: a novel mechanism for neutrophil dysfunction. Glycobiology. 2011 Jul. 21(7):914-24. [Medline]. [Full Text]. D'Eufemia P, Finocchiaro R, Celli M, Zambrano A, Tetti M, Ferrucci V. Absence of severe recurrent infections in glycogen storage disease type Ib with neutropenia and neutrophil dysfunction. J Inherit Metab Dis. 2007 Feb. 30(1):105. [Medline]. Pierre G, Chakupurakal G, McKiernan P, et al. Bone marrow transplantation in glycogen storage disease type 1b. J Pediatr. 2008 Feb. 152(2):286-8. [Medline]. Melis D, Della Casa R, Parini R, et al. Vitamin E supplementation improves neutropenia and reduces the frequency of infections in patients with glycogen storage disease type 1b. Eur J Pediatr. 2009 Sep. 168(9):1069-74. [Medline]. Melis D, Minopoli G, Balivo F, Marcolongo P, Parini R, Paci S, et al. Vitamin E Improves Clinical Outcome of Patients Affected by Glycogen Storage Disease Type Ib. JIMD Rep. 2016. 25:39-45. [Medline]. Pinsk M, Burzynski J, Yhap M, et al. Acute myelogenous leukemia and glycogen storage disease 1b. J Pediatr Hematol Oncol. 2002 Dec. 24(9):756-8. [Medline]. Chen Y. Glycogen Storage Diseases. The Metabolic and Molecular Bases of Inherited Disease. 2001. 1521-1551. Dieckgraefe BK, Korzenik JR, Husain A, Dieruf L. Association of glycogen storage disease 1b and Crohn disease: results of a North American survey. Eur J Pediatr. 2002 Oct. 161 Suppl 1:S88-92. [Medline]. Fernandes J, Smit G. The Glycogen-Storage Diseases. Inborn Metabolic Diseases. 2000. 87-102. Saltik-Temizel IN, Koçak N, Ozen H, et al. Inflammatory bowel disease-like colitis in a young Turkish child with glycogen storage disease type 1b and elevated platelet count. Turk J Pediatr. 2005 Apr-Jun. 47(2):180-2. [Medline]. Spiegel R, Rakover-Tenenbaum Y, et al. Secondary diabetes mellitus: late complication of glycogen storage disease type 1b. J Pediatr Endocrinol Metab. 2005 Jun. 18(6):617-9. [Medline].